Edvard Munch (1863–1944), Self-Portrait in the Clinic (1909), oil on canvas, 100 × 110 cm, Bergen kunstmuseum, Bergen, Norway. Wikimedia Commons. In 1892, Edvard Munch had been invited to exhibit his paintings in Berlin, long before the start of the Secession there. When that exhibition opened in November, his work was considered so shocking that it provoked outrage, and the exhibition had to close prematurely after only one week. The artist almost relished the reaction, and the exhibition was shown later in Düsseldorf, Cologne, and Berlin again. Despite (or perhaps because) of this, Munch fitted in well with the literary and arts circle around the Swedish playwright August Strindberg which met in the ‘Black Piglet’ tavern, and was able to develop the series of psychologically-dramatic paintings which became his Frieze of Life. 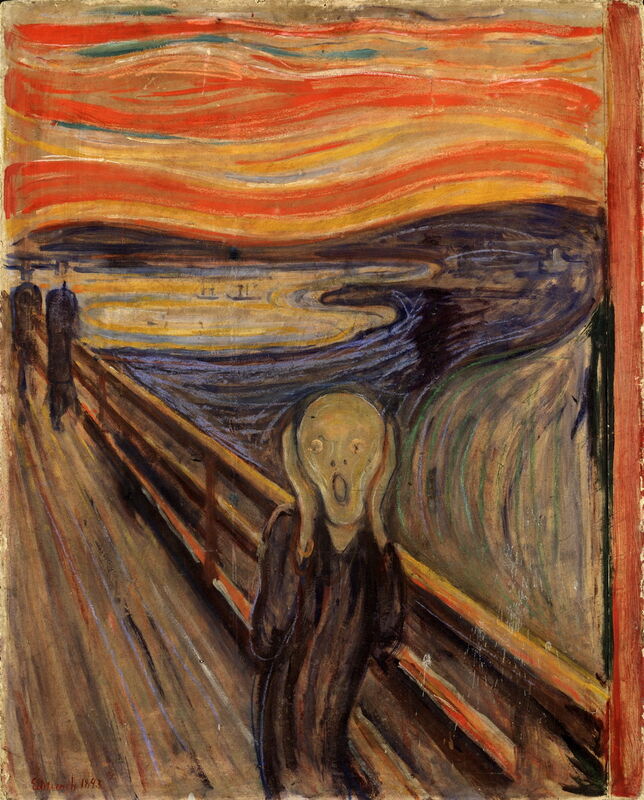 Edvard Munch (1863–1944), Despair (1894), oil on canvas, 92 × 72.5 cm, Munchmuseet, Oslo. Wikimedia Commons. 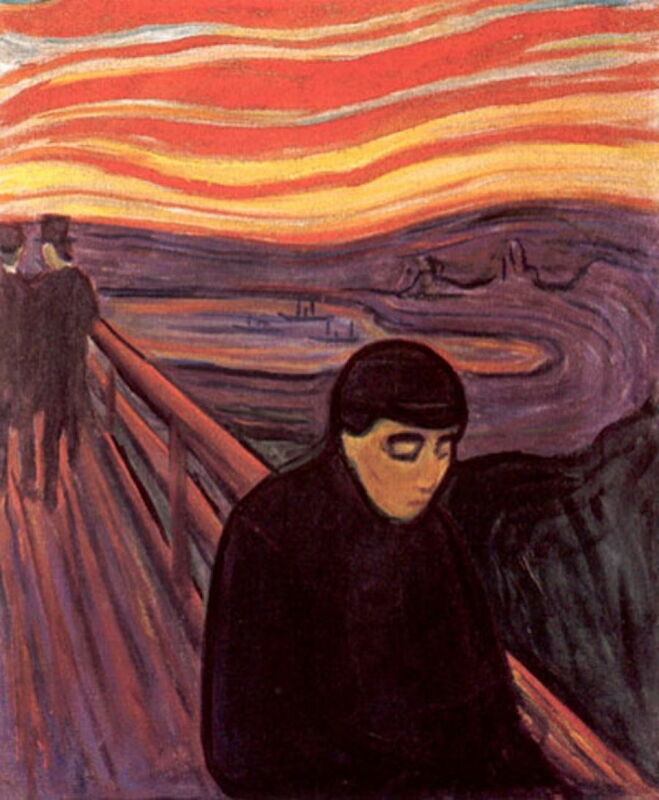 Munch’s first versions of Despair from 1892 were inspired by a blood-red sunset which he saw with the Norwegian painter Christian Skredsvig, when they stayed in the south of France in early 1892. This version probably dates from 1893-94, and is higher in chroma, with a different figure in the foreground. The view is from the same location above the city of Oslo, and the same vessels are shown at anchor in the fjord. 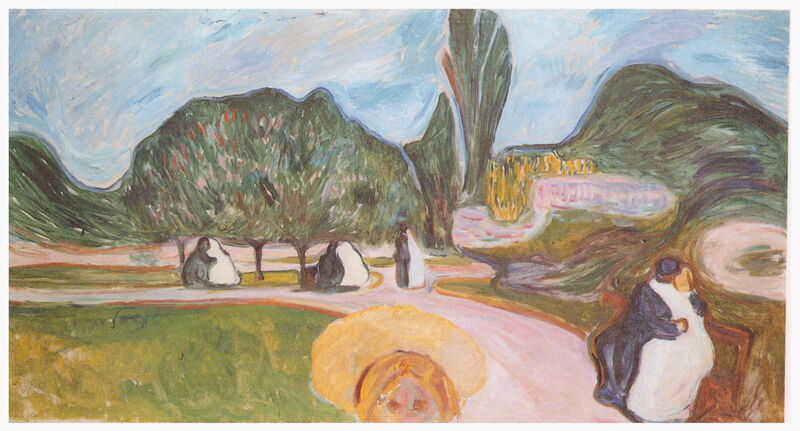 Munch returned to Norway in the Spring of 1894, and had a solo exhibition in Oslo in October 1895. In 1896, Munch moved to Paris, where he developed his techniques as a printmaker using woodcut and lithographic methods. His prints developed the themes which he had already initiated in his paintings, and sold well, enabling him to buy a summer cottage on the west coast of Oslo Fjord, about sixty miles south of the city. The following year he moved back to Oslo, and in 1899 began a relationship with Tulla Larsen. 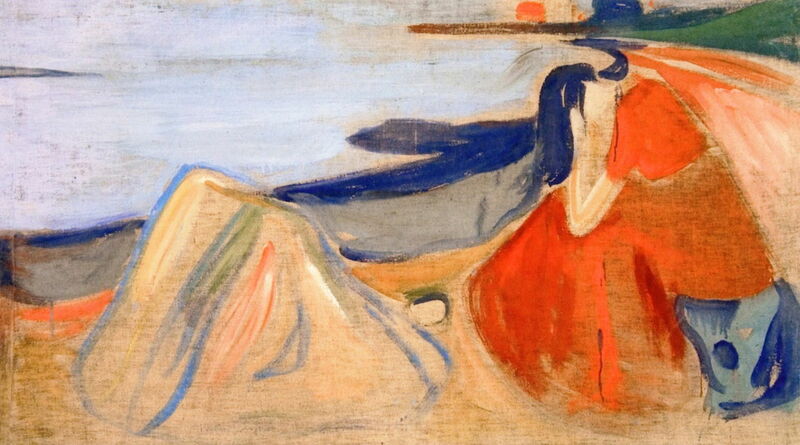 Munch and Larsen travelled together to Italy, which was a stimulus for a productive period in his work. But the following year, he left her after injuring his left hand with a shot from his own pistol, and he returned to Berlin, where he became involved in the Secession (and the Vienna Secession), and exhibited with it in 1902. Edvard Munch (1863–1944), Girls on the Pier (c 1901), oil on canvas, 136 × 125 cm, Nasjonalgalleriet, Oslo. Wikimedia Commons. His visits to Paris helped infuse Munch’s paintings with new colour, which may well have influenced the development of the Fauves. An example is his study in adolescence and the charged stillness of a Norwegian summer night: Girls on the Pier (c 1901). He again painted several different versions of this theme, including Girls on the Bridge (c 1902), below, in which the colours have been brightened by the light of day. 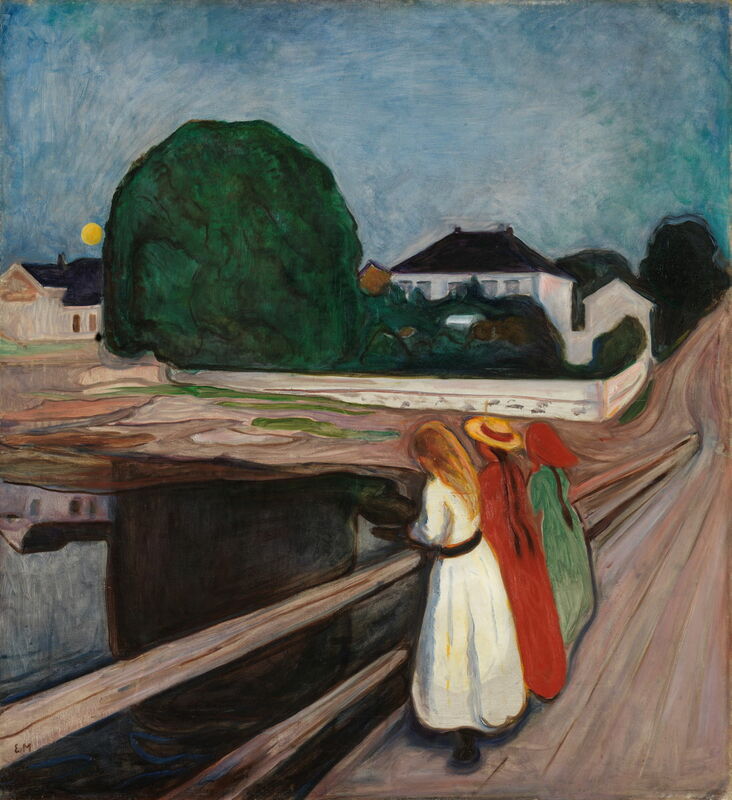 Edvard Munch (1863–1944), Girls on the Bridge (c 1902), oil on canvas, 101 × 102.5 cm, Private collection. Wikimedia Commons. This painting is currently – until 28 May 2017 – being exhibited at the Museum Barberini in Potsdam, Germany, alongside paintings by Liebermann, Nolde, and Kandinsky. After his visit to Italy in 1899, Munch decided that he wanted to create works suitable for large walls, which would be more monumental in scale if not intent. After he had exhibited his Frieze of Life at the Berlin Secession in 1902, he started incorporating its themes in these large paintings. In 1903, Munch was commissioned to paint a frieze for his patron Max Linde’s house in Lübeck. Edvard Munch (1863–1944) Loving Couple in the Park (from the Linde Frieze) (1904), other details not known. Wikimedia Commons. Loving Couple in the Park is one of the panels from Munch’s Linde Frieze, completed in 1904. Being based on his Frieze of Life, these dealt with adult themes, and Dr Linde felt them a little too charged for their intended destination of his children’s rooms. 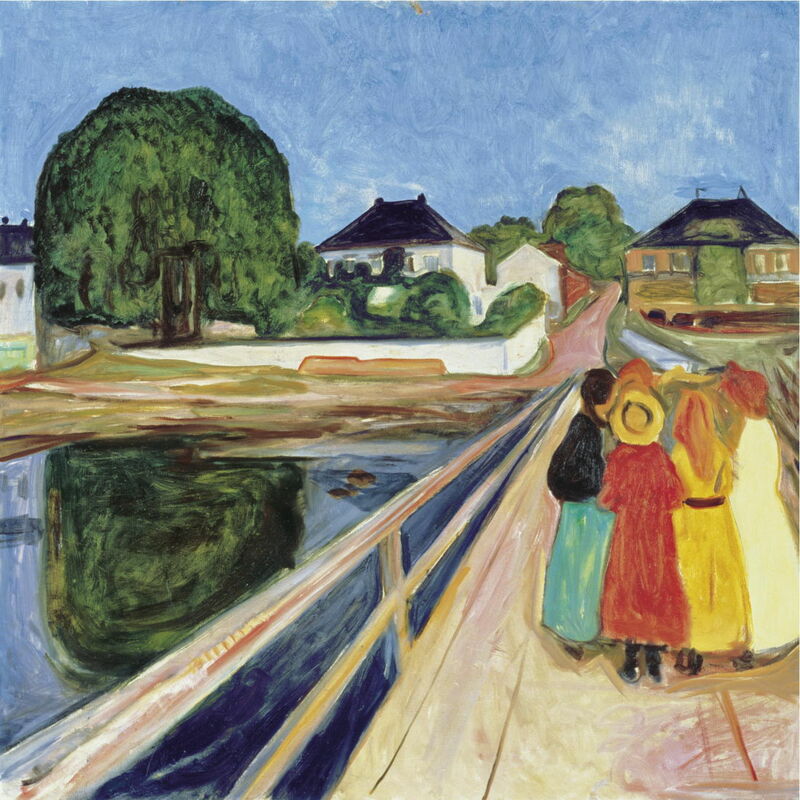 Munch continued to return to Norway each summer, but during his stay there in 1905, he had a violent altercation with Ludvig Karsten, and left Norway for Copenhagen. From there he travelled to Germany, where he underwent treatment for a ‘nervous disorder’ and alcoholism. In 1906, Munch was commissioned to paint a frieze for the foyer of Max Reinhardt’s theatre in Berlin, which was at the heart of Berlin’s avant garde. Edvard Munch (1863–1944), Desire (from the Reinhardt Frieze) (1906–07), oil on canvas, Munchmuseet, Oslo. Wikimedia Commons. I show here two panels from the Reinhardt Frieze: Desire (above) and Melancholy (below), which were painted between 1906–7. Munch used diluted paint on unprimed canvas to achieve the lightness of these, although the lower work is reported as using tempera. These are set on the undulating coast near his summer home on Oslo Fjord, and further develop his earlier images about mature love. Edvard Munch (1863–1944), Melancholy (from the Reinhardt Frieze) (1906–07), tempera on canvas, 90 × 160 cm, Neue Nationalgalerie, Berlin. Wikimedia Commons. Edvard Munch (1863–1944), Bathing Men (1907–08), oil on canvas, 206 × 227 cm, Ateneumin taidemuseo, Helsinki, Finland. Wikimedia Commons. Munch also planned a monumental polyptych with five panels, which was reduced to three, showing the ages of man. 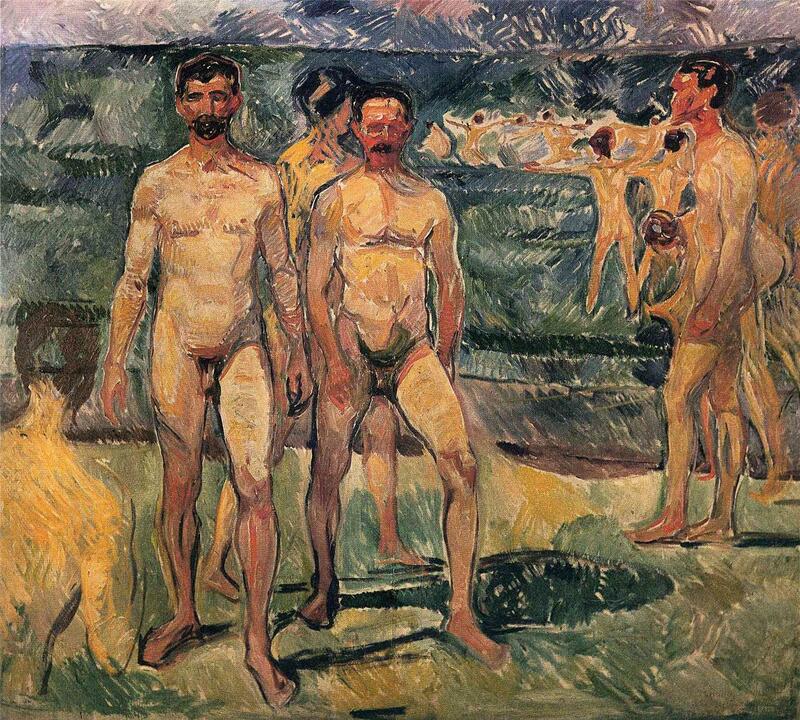 Bathing Men (1907–8) is one of the panels from that set. 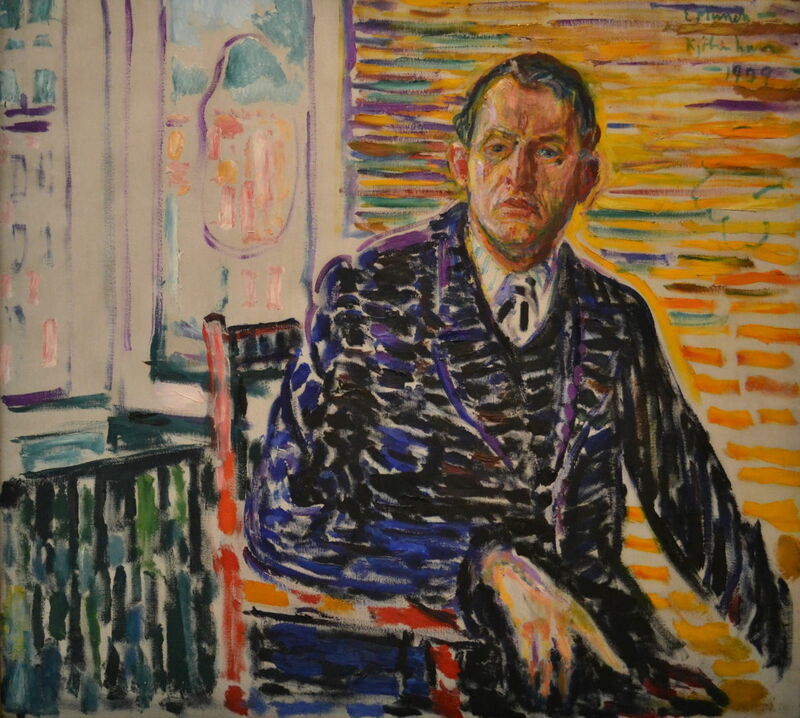 Arne Eggum draws attention to the contrast between the more extrovert attitude seen in these paintings, and Munch’s deteriorating health at the time. By the autumn of 1908, Munch was, by his own admission, verging on madness, resulting from anxiety, excessive drinking, and drunken fights. When he started to suffer from hallucinations, he voluntarily entered the Copenhagen clinic of Dr Daniel Jacobson for eight months, during which his condition stabilised then improved. Munch frequently painted self-portraits, but one which I find most insightful is his Self-Portrait in the Clinic, which he made as he was recovering in early 1909. His use of colour is almost Fauvist: he portrays himself in dark clothing, still anxious and in recovery, but the room around him is formed of bold brushstrokes of raw colour. When he was able to return to Norway later that year, Munch’s health was much improved and he was less full of pessimism and anxiety. He set up an outdoor studio for the summer, and then competed successfully to provide a series of paintings for the University of Oslo. Lampe, Angela, and Chéroux, Clément (2012) Edvard Munch, the Modern Eye, Tate Publishing. ISBN 978 1 84976 023 2. Posted in General, Painting and tagged Berlin, Expressionism, Fauves, Fauvism, Munch, Norway, painting, Secession, Strindberg. Bookmark the permalink. Has Apple fixed the bug which made Time Machine backups irregular?